Just for interest a Huntsman 28 is up on Apollo Duck, I think its rather cheap considering her alleged provenance!!! There is a Shakesperian Lady Class boat in Hartlepool Marina called Luctor-et- Emerigo has anybody any idea of what the name is/ or means sounds French/Belgian, as she was an Army boat is it a Regiment motto, a place of Battle etc. Thank You. The Latin motto of the province of Zeeland, "Luctor-et-Emergo" translates to "I struggle and emerge"
Slightly difrent spelling, but whats an 'I' betwen friends!! Motto of the Dutch province of Zeeland to denote its battle against the sea. Rather fitting for an Army vessel! S'funny, from Latin it translates as "I shine and arise".....kind of! Lucitor et emergo does anyway! 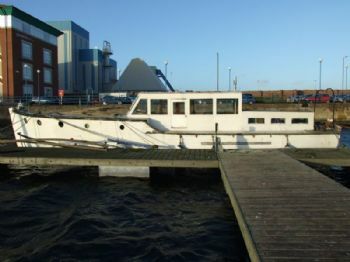 Is this any relation to the following boat advertised on the boats for sale page of this site- Eala Bhan - 45ft “Shakespearian” Class General Service Launch. 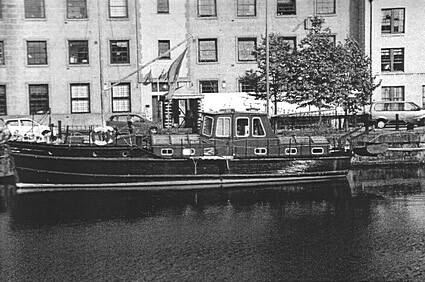 The boat in Hartlepool is listed as 46'5" but in most respects it looks similar. I have very little knowledge with regard to army boats so maybe a master class from somebody please. Tramontana just read your post in detail and realise both boats are Shakespearian Class but now that I have typed this I am going to post it anyway. How about more detailed information from somebody? Hi d-zine, The blurb on the bmpt ad was written by Philip Simons and gives accurate specs etc, however I think the Shakepearian Males Class differed from the Shakespearian Females Class but I am unsure how exactly. Don has a book with a list of all the names of both classes, which hopefully he can reproduce here for us, unfortunately the book does not give much more information about these boats other than the list of names. I'll do some digging.